B-1 strategic bomber is an iconic aircraft of the US Air Force. The development of the B-1B Lancer bomber was difficult to say the least. Originally conceived to fulfill a USAF requirement for an Advanced Manned Strategic Aircraft, the original B-1A concept aircraft was accused of being a white elephant, capable of performing nothing which could not be achieved at less financial and human expense than an intercontinental ballistic missile. 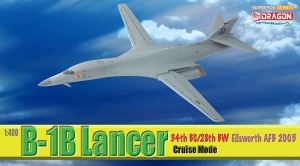 Cancelled by the Carter administration and finally commissioned by President Reagan as the modified B-1B, the Lancer began its duties as a nuclear-armed bomber in the mid-1980s. The end of the Cold War (1946-1991) intervened and the jet was removed from its nuclear missions as a result of arms control legislation. However, the 1990s saw the metamorphosis of the Lancer into a potent conventional weapons carrier which has seen action in Iraq, the Balkans and Afghanistan. The Lancer has proved its critics wrong in demonstrating its use as a highly flexible and hard-working bomber, able to undertake diverse missions ranging from CAS to the targeting of weapons-of-mass-destruction installations. This volume profiles the Boeing North American B-1 Lancer, the last mass-produced strategic bomber in the US, sporting the most complex mechanical and electronic systems of any warplane ever developed. The book includes detailed explanations of technologically advanced flight and warfare avionics and descriptions of abilities and limitations evolving through changing missions and modifications. This book should be of interest to: general readers and enthusiasts; historians; those with an interest in the military; pilots; designers; engineers; and manufacturers.